Most of you have heard about Jim Collins’ book, “Good to Great.” A good number of you have read it. Great companies have, for the most part, always been great, while a vast majority of good companies remain just that: good, but not great. What could merely good companies do to become great? How can their leaders turn long-term weakness into long-term supremacy? You can improve service and work hard to improve quality. But when you have managed to improve service; give 100% same day service and you have the inspector of your dreams, are you finished? That can’t be right, can it? Once you become great, are you finished? That surely doesn’t sound right. I think the first step is to evaluate your quality like a finicky customer. It really isn’t that easy to do. You and I have a stigma that makes it remarkably difficult to see these trees in the forest. When we see ultra-common mistakes, they disappear. I was in a plant with a great reputation for excellent quality. When I did casual inspections of garments around me, it was not clear to me why he has this reputation. Here are some of the things I see, not just at this plant, but at many plants. The remedies are simple. If you find these issues, you can eradicate all of them in minutes. Just by informing the presser(s) and inspector(s) that there is a new standard. 1. No creases means no creases. No creases does not mean “put creases in the wrong place.” It amazes me how often I see this pressing error. Look at figure 1. This was done on a flat press. 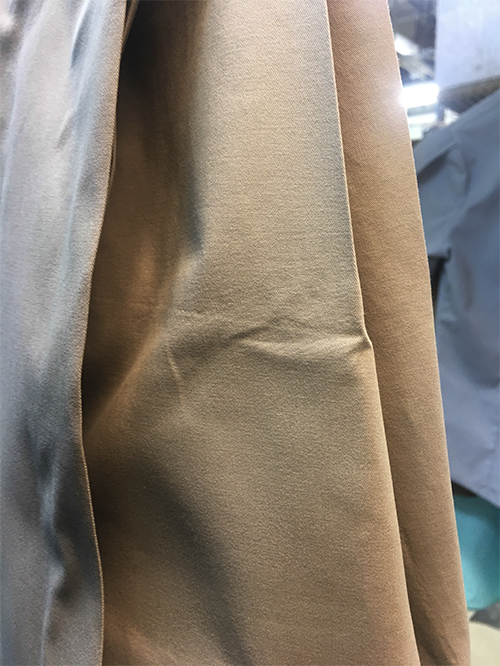 No crease is simply accomplished with up-steam and without bringing the head down on the garment. When the pants are folded over a hanger, there is no crease. The fold is round. What you see in the photo is a flat press, poorly executed at that. This pressing method has very little value to the consumer. Why don’t customers return these pants to you? Because they don’t know exactly what to expect. 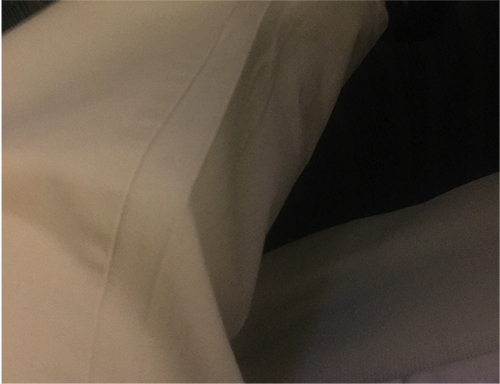 When they request “no creases” they mean exactly what you think it means: no creases on the front of the trousers. They got what they wanted, they think. Go from good to great. Educate your pressers and your inspectors. 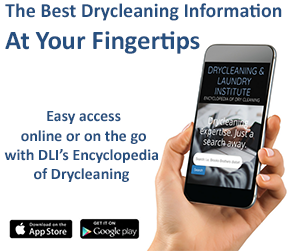 Your customers may not notice what is different, but they will feel better about the clothes you care for. 2. Hanging threads and hairs. 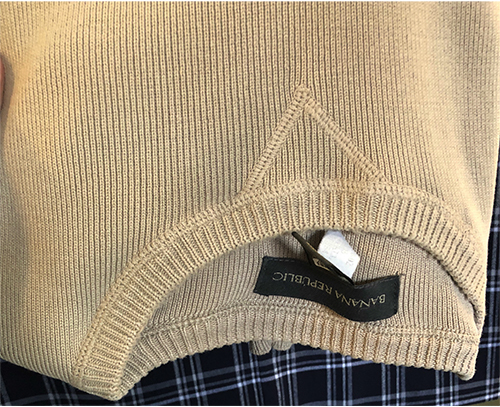 It’s hard to believe inspectors don’t see these and a customer probably won’t regard you as a poor cleaner if they get a garment like the one in Figure 2 but it can easily be avoided. You aren’t a bad cleaner if you send out a garment like this. But your customers will eventually realize that garments they send to you don’t come back to them ready to wear. They may notice the loose thread, but they won’t notice the one that isn’t there. The difference between a good cleaner and a great cleaner is as fine as the thread on this garment. The fine line is there, but you have to look for it to see it. ]3. Never press a cuff flat. It amazes me how often I see this one and I am equally amazed at how rarely a customer complains about it. If you are bored with being good and aspire to be great, start here. Pressing cuffs flat is bad for four reasons:a. There is no way to press the cuff without leaving an imprint from the other side of the cuff.b. You will not be able to get the gusset and the sleeve pleats correctly. You’ll just make a mess.c. The inside of the cuff will not be pressed properly because the cuff isn’t intended to be pressed that way.d. The cuff was never intended to have a crease. Why do pressers even think of this and why do inspectors accept it? Figure 4 – This is so easy to avoid. Go from Good to Great! 4. 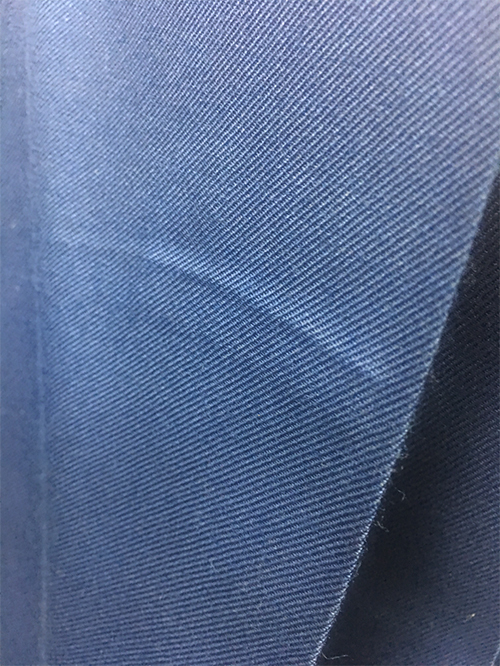 Seam impressions on pants. Many of these slip through the cracks, but there are pocket impressions, too. Look at Figure 4. These are easy to avoid, so don’t let your pressers lower your quality standard. Good cleaners allow this. Great cleaners do not. Figure 5 – Our professional equipment can do a great deal, but presser skill is still part of the equation. 5. Leave off marks. We have equipment that presses trouser legs and other equipment to press the tops of pants. Sometimes the pressing is not seamless. Pressing still needs the injection of a skilled operator. Absent that, you may be good, but not great. 6. Careless presentation. Sometimes, a very small amount of attention to detail goes a long way. The two sweaters in figure 6 are presented in a careless manner. One is folded asymmetrically and the other would have benefitted from buttoning a few buttons. 7. Press impressions. Lastly, when a customer sees a press impression like the one in figure 7, they may consider it’s unavoidable and see clearly what caused it. But great cleaners prevent this and his or her customers never see it. The customer of a great cleaner doesn’t really know it. They don’t know what they don’t know. They don’t know all of the things that could have gone wrong. But the attention to detail a great cleaner contributes shows itself by being invisible to the customer. It is a difficult concept to wrap your arms around but it is a feeling that you will instill in your customers.